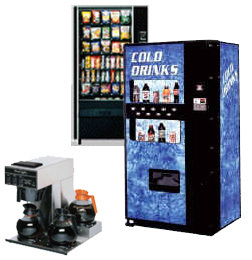 Automatic Vending is a full service vending company with it's main office in Santa Fe, New Mexico and two satellite offices, one in Farmington and the other Tucumcari We provide service to Santa Fe, Albuquerque, Bernalillo, Rio Rancho, Espanola, Los Alamos, Taos, Santa Rosa and other surrounding areas. Automatic Vending offers a variety of different vending services, including healthy snacks, candy, pastries, canned and bottled drinks, coffee, sundries, and various food products. We also offer a complete office coffee service that can provide your business or office with all that is needed for a complete coffee bar from hot chocolate to teas, soups, flavored creams, and specialty coffees.